Windhelm Stables is a stable outside of Windhelm. You can purchase a bay horse with white markings for 1000 gold from Ulundil. If Ulundil dies, his wife, Arivanya, will instead offer to sell you the stables' horses. It consists of one area only, Windhelm Stables. 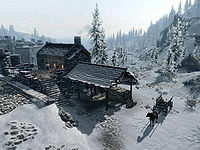 Two flights of stairs (one from stony path leading to Windhelm and one from the carriage) lead to a small stony yard in front of the house. There is a table outside the entrance door with a wine bottle on it. Between the table and the entrance are five food sacks on the ground (two large, two normal and one small). Beneath the stairs connecting the house and stables is one bottle of Nord mead cooling in the snow, just out of the way and some barrels behind. In the northern corner of the stables are some barrels, four food sacks (two large and two normal) and a wood chopping block (without a woodcutter's axe which is to be found inside the house on the shelves just upon strongbox and unable to interact with) then two horses (of which one is saddled) and bales of straw. Outside the stables along the road to Brandy-Mug Farm is a manger containing one bottle of wine and some firewood. Behind those along the eastern wall are some crates as well. The stable building is one room only, with a double bed along the western wall. In the southwestern corner is a wardrobe with clothes and in the adjacent corner sits a dresser, also with clothes, and with the Business Ledger on top. Two sets of shelves decorate the northern wall and display a strongbox, a draught of strength, some leather strips, an iron ingot, two bottles of wine, a bottle of Nord mead, a wheel of eidar cheese, and two food sacks. Opposite the shelves, next to the front door, is a table with a few common books. The eastern part of the stable house is reserved for dining and has four food sacks, three large and one small. The dinner table is placed in front of the roaming fireplace and a cooking spit. The table itself holds some assorted food, a goat cheese wedge, two red apples, and two loaves of bread. This page was last modified on 17 September 2018, at 14:10.